This book made me appreciate reading again. 2016 was one big book slump for me. I couldn’t find anything I liked and much of what I was reading was far too serious. I picked up Daughter of the Pirate King on a whim and for the first time in a long time I remembered what a joy reading can be! This book is fun. It is pirates hunting for treasure, being scallywags, and living life on the high seas. It was exactly what I didn’t know I wanted. This novel follows pirate captain Alosa. She is the daughter of the pirate king (hence the title). The story begins when Alosa is captured by rival pirates. Only, the jokes on them because Alosa was planning to be captured all along. She is searching their ship for a legendary treasure map. One said to lead to an epic trove. But all is not smooth sailing. Alosa is a great heroine. And I liked seeing her be good at what she does, pirating. The days of girls needing saving are long over! Alosa is the captain of an almost entirely female ship and they’re the best of the best. I’m looking forward to seeing more of the crew in the sequel. The best part about this story was the witty banter between Alosa and Riden. They reminded me of Mr. Darcy and Elizabeth from Pride & Prejudice. Only with more kissing. And more pirates. The relationship between Alosa and Riden is a slow burn that you can’t help rooting for. The only thing I didn’t like about this novel was that I have to wait for the sequel! I’m excited to read more about Alosa, Riden, and the entire pirate crew. When I read this book I desperately needed something fun, light, and interesting. This book was all three! Put this on your to-read list now. I'm so happy you liked this one. I've been waiting for this one so long. Your review is making me really excited to get my hands on it. This review has me so excited to pick it up when it's released! 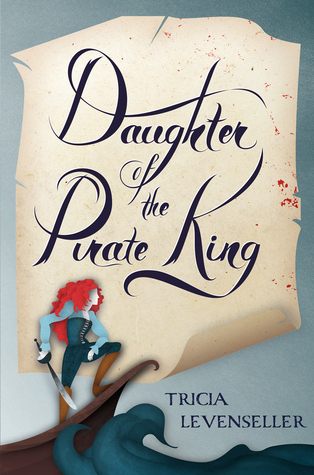 Daughter of the Pirate King is one of my most anticipated debuts of this year. I'm so happy to be hearing such amazing things about it! So glad it was able to bring you so much joy. I'm really excited to read this one - Great to see you enjoyed it so much! Although I always worry when I go into a book with such high expectations - however its sounds like a super read. Great review!